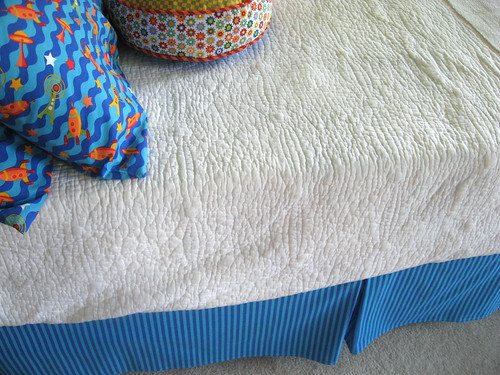 I made a bed skirt last summer using bot camp fabric from Michael Miller. I must say, it's fun looking at pictures I took way-back-when when the sun was actually shining. Sigh, I miss those days. When I look at this picture I also get excited at the thought that those white carpets that came with the house will soon be gone. Wood floors, baby, here we come!!! Woo hoo!!!! Nothing like embarking on a huge home reno project right before the holidays. Can't be helped. 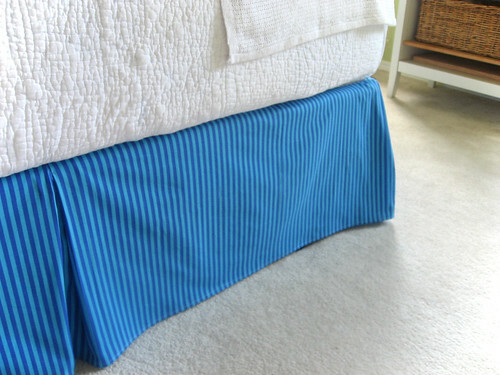 The PDF tutorial for the bed skirt is here.